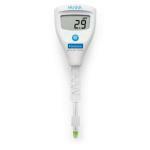 Quantofix Ammonium - Water Test Strips Quantofix ammonium test strips allow the quick and easy determination of ammonium in solutions. 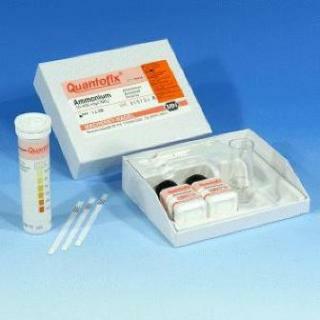 Quantofix ammonium test strips come with all necessary reagents so that the measurement can be started immediately. Within 10 seconds one gets a reliable result. Naturally, ammonium results from the biological decay from plant and animal matter. 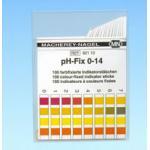 High concentrations can be found in rural, farming areas where fertilizers are regularly used. Also, industrial effluents may contain ammonium in high levels. Ammonium itself is relatively harmless. Depending on the pH, however, part of the ammonium is transformed to the aggressive NH3-gas, which is poisonous for aquatic life. Ammonium levels >1 mg/l are not suitable for fish. As an indicator for decomposition of animal or vegetable substances, control of ammonium is also important for the water supply. 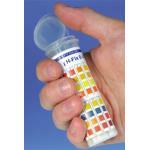 With Quantofix Ammonium test strips the determination of ammonium is easy, quick and reliable.